The United States is on the verge of breakthrough legislation for both primary (single-use) and rechargeable batteries. This shift from a voluntary approach to a regulatory approach covering both battery types has coalesced over the past six months, as an increasing number of government agencies have expressed interest in a legislative solution to household battery management. 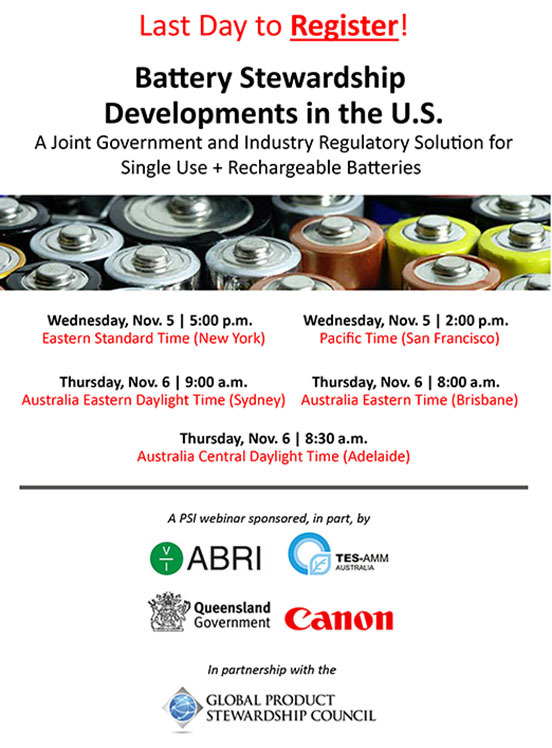 This webinar will discuss the unique differences between the single-use and rechargeable battery industries, key issues that are being addressed to find a unified legislation solution, explore lessons for other countries such as Australia (where consultation is underway on a national battery stewardship scheme), and outstanding challenges faced by US state and local governments, manufacturers, retailers, and other key stakeholders in the year ahead. if attending from the U.S. – Nov. 5th at 5 p.m. EST. Please note the time change for U.S. participants. Moderated by Scott Cassel, CEO & Founder, Product Stewardship Institute. Introduction by Russ Martin, CEO, Global Product Stewardship Council and Independent Chair, Australia’s Battery Implementation Working Group. Registration is free for Australian residents thanks to our sponsors the Australian Battery Recycling Initiative (ABRI), TES-AMM, Queensland Department of Environment and Heritage Protection and Canon, in partnership with the GlobalPSC. For details on how to register at no charge please contact Russ Martin at russ@globalpsc.net.